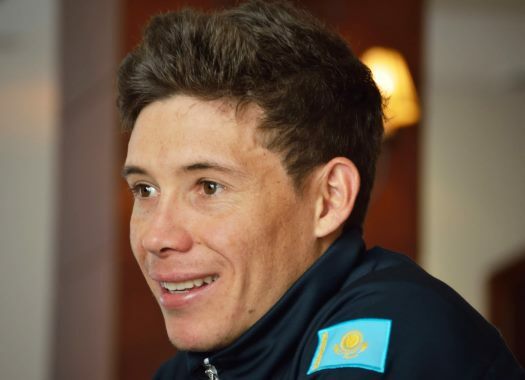 Astana's Miguel Angel Lopez crossed the finish line in the second position at the 15th stage of the Vuelta a España after a day of long work by his teammates. From the beginning of the stage, it was clear that Astana wanted to try something today, as all the riders set a high pace at the front of the peloton, even on the last climb. Its leader attacked several times at the last climb and took the second position of the day. "I want to thank my team for a great day at La Vuelta," said Lopez at the finish line. "My teammates did an amazing stage, we proved to be one of the best teams here. I think we deserved to win today. So, I tried to attack far from the finish. I like this kind of attacks, it helps you to understand who are your rivals in the race. The team was keeping so high pace, so I think, it was a right moment to try. In the end, I did all I could today and I don’t have anything to regret about." But the Colombian rider wanted a better result on the stage of Lagos de Covadonga. "Of course, I am a bit disappointed because we had a clear goal to win the stage and we did our best for that," Lopez explained. "But, the strongest won today. I counterattacked with something 1,5 km to go, wanted to get some time, but the last 200 meters were really tough. "At the end of the day, I have another second place. But, I will keep on fighting in this Vuelta. We still have a full third week and I am happy I am in a good shape ahead of it. All the favourites are close in the classification and the race is still open."